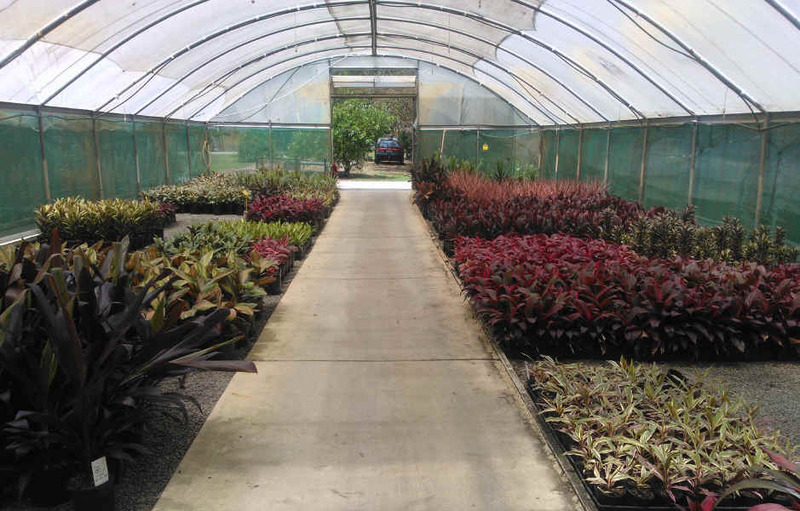 This is the range of Cordyline terminalis and fruiticosa that we believe are the best for landscape use. We have selected them to give a range of colours and styles that will suit most gardens. 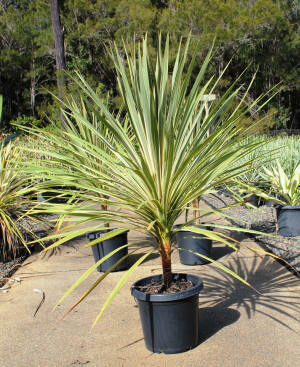 In general ,light shade is best for these plants but some such as Cordyline terminalis rubra will happily grow in sunny positions once acclimatised. 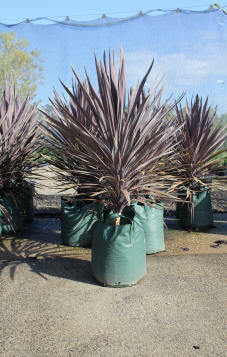 Cordyline Negra and Pink Diamond are tall growing sun varieties that make excellent impact plants and will grow 2-3m. Cordylines in general prefer a moist to dry environment and can be pruned heavily to encourage fresh new growth in mid Spring. The above Photo is our Cordyline production area Most of our Cordylines are grown in started in this area and from here hardier species that will tolerate the sun are moved into our outdoor growing areas and sun hardened. All of our larger growing Cordylines such as C. negra and C. Pink Diamond are started here in 200mm and sun hardened in 300mm. This means that when they arrive at your landscape site the plants will be sun hardened and ready to plant. Cordyline Pink Diamond is a large bold Cordyline tending to a single stem and growing 2m plus. Pruning will encourage multiple stems and a dense habit. It will grow in full sun or semi shade. 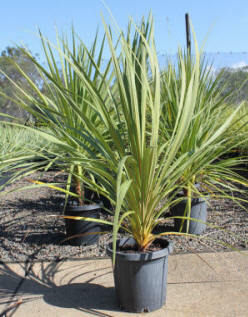 Cordyline Negra is one of our favorite Cordylines with it's large dark red almost black foliage. It will grow 2m plus in sun or shade and can be pruned to create a multi stemmed plant. Cordyline terminalis Rubra is one of the staples of landscapers and designers and for good reason as it is one of the hardiest and most colourful Cordylines in sun and shade. One of the most popular of the red australe forms single stems initially but will multi stem if the growing tip is damaged and also as it grow older. A plain green Cordyline that need full sun and well drained positions. Single stem initially but will multistem as the plant ages.